Richard L. Sandor, recognized as the “father of the financial futures markets” for his work creating futures contracts on currencies, Treasury bonds and mortgage securities, has a simple proposition for boards of directors. When a futures market exists for products your company makes, or supplies your company buys, or the currency or interest rate risk your company faces – does your management team use those futures markets to quantify or control risk? If not, a board is simply speculating – betting that the price of fuel, or metal, or money, is going to move in a certain direction. A decision not to use available risk-management tools to hedge commercial or financial risks is a decision to speculate, says Sandor. 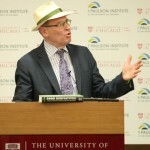 Speaking to a hometown crowd gathered June 20 at the Chicago Council on Global Affairs to mark the publication of his book, “Good Derivatives: A Story of Financial and Environmental Innovation,” cited the role of fuel hedging by Southwest Airline as a major factor in outdoing those airlines that left themselves – and their shareholders – exposed to the volatility of world oil markets despite the existence of highly-liquid, well-regulated futures markets where they could have transferred the risk of rising fuel costs to other parties and thereby prevented or reduced financial losses. One result of the financial crisis is that the word ‘derivatives’ is now applied indiscriminately, blanketing contracts traded on regulated futures exchanges with the same opprobrium heaped on the too-clever financial instruments that Wall Street engineered to trade among themselves and their biggest clients. The former are risk mitigation tools linked to underlying commercial activity in metal mining, agriculture, financial services and a host of other business activities. The future price of any of these useful contracts is determined in a transparent process that balances supply and demand factors. What we saw in the financial meltdown were financial products that were opaque and which offered no counter-party guarantees because they were traded “over the counter”, between sophisticated firms that supposedly knew what they were doing, instead of being traded on regulated exchanges that utilized an independent central clearinghouse to monitor the financial status of market participants and ensure timely payment by both sellers and buyers of futures contracts. What about the management of companies in using hedging devices such as derivatives? Sandor suggests that the board develop an understanding of available derivatives markets and hold management accountable if they don’t find a way to utilize derivatives to manage the risks inherent in their respective businesses. At the same time, boards need to inform shareholders how the governance process intended to serve as the shareholders’ fiduciary representatives encompasses the use of available hedging and risk-transfer tools, or provides the rationale for foregoing such protection and accepting exposure to volatility in the cost of financing and other inputs. If Americans don’t “get derivatives,” the Chinese do. Sandor’s firm, Environmental Financial Products, specializes in inventing, designing and developing new financial markets. Sandor serves as a distinguished professor of environment finance at the Guanghua School of Management at Peking University.